Because an ice cream store in my hometown does not have a seating area, patrons gather in the parking lot after making their purchases. As families, sports teams and young couples spoon ice cream from cups or lick trails melting down sugar cones, drivers restlessly pick their way through the crowd in search of an open spot. The small lot has not been marked with arrows or parking spaces. It is also uneven, as pot holes have not been repaired for many seasons. Since the store is open only from April through November, I imagine the owner is reluctant to direct money into capital improvements. He must feed, clothe, entertain and educate his family with money earned during the summer months, as his bank account dwindles between Thanksgiving and Easter. While, as you can tell, the store’s owner has elicited my sympathy, I believe he is placing his customers at risk. Automobiles and children, unlike vanilla ice cream and sprinkles, are a dangerous combination. When Ben & Jerry’s opened a store in town a few years ago, the franchisee chose to build on a different footprint. Not only does this store include a dedicated seating area with benches and umbrellas, there is even room left over for the occasional musical act. One night, while licking Phish Food from a sugar cone, I sat on a bench thinking how Ben & Jerry’s had built and paid for the seating area the owner of the “legacy” ice cream store had chosen to forego. I thought how if you don’t give your customers what they want and need, a competitor would happily oblige them. In 1914, Austria declared war on Serbia to begin World War I. This was also the year Henry Ford declared customers could choose any color automobile they want so long as it is black. During the next decade the public chose to agree, as production at The Ford Motor Company peaked at nearly 2 million black cars in 1923. During a recent past weekend, our daughter planned to join my wife and me for a weekend getaway. Like many young people, she does not have a car. As a workaround, she would board a Short Line bus in New York City’s Port Authority. Also like many young people, she is accustomed to purchasing transit tickets through apps on her mobile device. If she doesn’t use a mobile app, she expects to find a ticket machine conveniently located at the station or terminal. Because Short Line’s mobile app gives route directions but does not also sell tickets, our daughter arrived at Port Authority one half hour early to purchase her ticket. Because Short Line’s mobile app does not sell tickets and there are no ticket machines conveniently located at the terminal, the line at the ticket window was too long for our daughter to purchase a ticket in time to board the bus. Because the bus driver can accept cash payment only if the ticket window is closed, she missed the only bus scheduled for that route on that day. While I cannot know why Short Line has decided upon its ticketing strategy, I do know it is out of step with the norms of the marketplace. By continuing to occupy a space outside these norms, seats that would be otherwise filled will remain empty. The insurance business, like the ice cream, automobile and transit businesses, exists in a dynamic ecosystem. This dynamism begins with risk. At the start of the 20th century, insureds were more likely to be injured by a horse than by an automobile. As this century progresses, it is possible insureds may be more likely to be injured by a line of code than by an automobile driver. 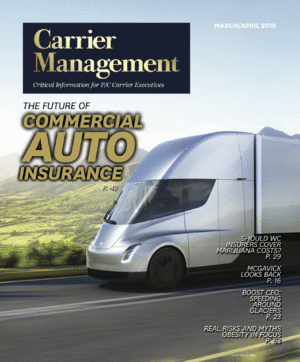 The only constant is that carriers transfer risk to insurance products. The nature of this risk, along with the mechanism by which it is transferred, is mutable. Technological advances teamed with insureds’ evolving expectations will drive the insurance business forward, whether or not individual carriers or brokers do the work needed to stay current. Just as Henry Ford had every right to paint all his cars black, consumers had every right to migrate to the General Motors platform where they could choose the color of their cars. While the future will always be a mystery, a great deal can be known. For every carrier or broker electing to not meet insureds’ changing needs and expectations, a competitor will happily fill the breach. While we may not know what technology will look like in the future, we do know it will be different. Excluding other variables such as financing, branding and reputation management, carriers and brokers who do the best job of incorporating new technology into their platforms will be voted most likely to succeed. According to a study fielded by The Jackson Group and Aon’s Ward Group, as reported by Carrier Management, 63 percent of insurance companies will be hiring during the coming year. This represents an irretrievable opportunity for these companies to hire change agents to help guide them to futures signified by success and opportunity. While change may be inconvenient, it is necessary in order to move forward. The opposite of moving forward is to be left behind.